I will be at Fan Expo Canada in Toronto this weekend with Blind Ferret and Randy Milholland of of Something*Positive. I will be at booth #844. More info HERE. Doesn’t the army have a gum that Navy Seals chew to stay awake for like 72 hours? I’m pretty sure I read about that one night… morning… possibly afternoon. When you never sleep, it all sort of bleeds together. Working for yourself and working from home is a deadly combination. There’s no one telling you that you HAVE to do anything at any certain time and there’s nowhere that you have to go where your bed and TV aren’t. Despite this ease of procrastination, I often find myself working 3 to 4 five plus hours “shifts” in a day. Any time that I’m not producing feels like loafing because I am always physically AT WORK. I’m here, I’m awake, why am I not working? Dinner? That’s for gold brickers! TV? Well sure, I’m going to watch a lot of it, but I’m going to feel guilty as all hell about it. Anyway, I’m not complaining. I’d rather be going to bed at 5am, sleeping until 2pm and feeling out of phase with reality everyday while drawing cartoons for a living rather than getting up at 6am just so I can spend 10 hours in a place I don’t want to be, with people I don’t like, doing a thing I don’t care about just so I I can get home at 7pm, eat dinner, watch 2 hours of guiltless TV then go to bed and do it all over again. To reiterate: I AM NOT complaining. COMMENTERS: Do you get enough sleep? Does anyone? How do you quiet the demon to-do list in your head? What are your tricks? Potions? Spells? Booze? 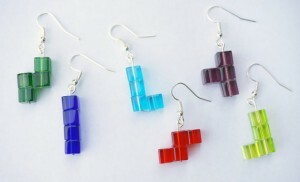 Check out these Tetris earrings my wife made! Booze, sad to say. As a student, I need to sleep, and often, I drift off, and get a text from some godless idiot (or my brother) that wakes me up and my brain will no longer shut off. So, my secret potion is booze. Maybe a Vodka martini (I have a bottle of Stolichnaya on my desk). Maybe a Rum and tonic. If I drink just enough, in a half hour I get that buzz going and my brain stops sabotaging itself, and I can achieve sleep without having a hangover the next day. Needless to say, tonight, I both failed to imbibe, and am failing to sleep. You know, they make a function that turns off the noises/vibrations on them thar cell phones. They also come with an “OFF” switch. But, perhaps your liver will thank you for your home sleep remedy eventually. Good times there. Sleep? HA HA. Ha ha… ha. I get enough sleep. However, I’d sleep ten hours if there were no witnesses. But when my head is wondering and I can’t sleep after an hour, I just get up and do whatever is keeping me awake. Then I usually fall asleep two hours later. Sleep is my super power, I can lay down anytime, anywhere and shut down for a few hours. To get my stress levels under control and NOT have a heart attack by 35, a health coach (which is a nicer-sounding name for behavioral therapist) taught me how to deep breathe right before I went to sleep. Took a couple of weeks of practice for me to feel like I was doing it right, and another couple of weeks for me not to feel like a right idiot when doing it, it manages my stress well. And, bonus side effect, it seems to have cured my work-guilt-induced insomnia – I count back from 100 on every exhale and have yet to make it to 50. I learned I have to force myself to follow standard work hours: I work from 8ish to 5ish and that is all. I do not allow myself to work in non-work hours, and I don’t let myself loaf (too much) during those hours. Of course, having two school-age kids helps enforce this – they get on the bus, and I work until they get home. After following this pattern for a few years, I started shifting the time I felt most creative from the inconveniently located late at night to the daytime. P.S. re: the comments about drinking to fall asleep – be careful. A friend had insomnia, and ended up in the hospital after unintentionally combining a drink with sleeping pills. I have several friends who work from home, and one thing I’ve heard that works very well for (almost) all of them is to have a, well, a commute. See, they designate a certain part of the home as their “workplace.” When it’s time to work, they go to the workplace, and when it’s time to stop, they leave it. The trick is to make sure it’s not an office or den or other area where you do other things besides work. Sure, that’s not practical for everyone, but it doesn’t have to be much either. Maybe it’s a chair or table that you only sit in when you’re working. I don’t know about the Army having gum for Navy SEALs. Probably the Navy has gum for Navy SEALs. It’s a gum the Army uses to seal the Navy into boats. I’m one of the soulless ones who works overnights in a grocery store. So I sleep when I get home for about 4 or 5 hours then take a nap before I go to work. Seems to be working after 15 years. I’ve started doing online crossword puzzles right before bed. When I want to sleep, I work on crossword puzzles. And over time, my brain has made the connection “puzzles=sleep.” It works almost every night now; I start playing, I get drowsy, set the laptop down, and fall asleep. When I worked nights and kept abnormal hours I usually took melatonin to help me sleep. Since it’s the hormone your body produces to make you sleepy, it’s reasonably “natural” and I did not find it habit-forming. Now that I keep normal hours I find I rarely need or want it and sleep fine; and some days I’d get home from work and was so tired that damn the sun I just fell asleep at once. It’s far less expensive than any prescription sleep med and you won’t half wake up and try to make coffee with salami or something like people do with ambien. I also find that valerian root helps to quiet the incessant shouting in my head about all the things I haven’t done (today; in this lifetime; whichever). It’s also usually cheaper than melatonin; both of them are at the CVS or Walgreens. Valerian doesn’t really make me sleepy, it makes me less anxious. From what I hear that’s almost what normal people feel like, but I wouldn’t know. It smells like bad asiago cheese, though, so keep some listerine around. When I read this, I laughed so hard I made my wife drop the meatballs she’s making for dinner…at eleven thirty at night. I have been an insomniac almost all my life and now that I work for myself at home, it has free reign. It’s not unusual for me to spend fourteen hours trying to get eight hours of sleep. Ambien used to work. Then it started not working and my doctor switched me to trazodone, which I, of course, check on wikipedia where I find that it is usually used as an anti-depressant. Because, of course, there’s no way in hell that information is ever going to keep me up. What is this “sleep” you speak of? It sounds strange and wonderful. I have trouble getting my brain to shut down long enough to get to sleep, and I don’t even work at home. I’ve always had trouble getting to sleep, but, once upon a time, once I got to sleep, I could sleep non-stop for twelve or more hours. No longer. Several years ago I hurt my back, and could hardly sleep at all due to the pain, and even once it started to get better, and I was able to get to sleep more easily (or at least with no more trouble than I ever had), I was unable to stay asleep long enough to get a “good night’s sleep,” and would end up waking up every few hours. These days, my back problem is under control, but I never have recovered the ability to consistently sleep through the night (or day), without waking up frequently, and sometimes being unable to get back to sleep for a couple of hours after I’ve woken up in the middle of the night. I’ve tried valerian and chamomile to no avail (although chamomile has helped me with other problems.) Melatonin sometimes helps for 4-5 hours, but not long enough for a full night, and sometimes causes me to have odd dreams. Booze also sometimes helps for a few hours, but can be counter-productive once I metabolize the sugar in the alcohol, and end up being wide awake in the middle of the night. Red wine tends to be more effective than other types of alcohol, but isn’t foolproof. So far, I have yet to find that “magic bullet” that will solve my insomnia problems. Luckily, my insomnia tends to run in cycles, so eventually, I will sleep. I just never know when, and, of course, I never seem to be able to sleep when I most need to. As for sleeping… something I find helpful for “Brain Chasing Its Own Tail Syndrome” is L-Theanine, the calmative amino acid naturally found in green tea. A friend of mine who was going through a great deal of stress described it as “nearly as effective as Xanax – and since I don’t have to worry about getting hooked, on balance it’s better”. Posted in Uncategorized and tagged autobio, health, insomnia, sleep.